This all-sky view shows how the sky appears at energies greater than 1 billion electron volts (GeV) according to five years of data from NASA's Fermi Gamma-ray Space Telescope. Image uploaded on Aug. 21, 2013. A NASA space telescope tasked with probing the most powerful explosions in the universe has a new lease on life. NASA officials said Wednesday (Aug. 21) that the Fermi Gamma-ray Space Telescope, which has just completed its initial five-year study, has officially entered an extended mission phase. The extension will allow Fermi telescope scientists to further probe the Milky Way in search of gamma-ray signals from elusive dark matter. Scientists hope the space observatory, which launched in 2008, will ultimately last a full decade in orbit, but will depend on future reviews. Scientists working with the $690 million Fermi telescope may change up their observing strategy for the new portion of the mission. The Large Area Telescope (LAT) instrument onboard Fermi will start to take deeper exposures of the central portion of the Milky Way. This part of the galaxy is filled with sources of high-energy like pulsars, possibly making it a great place to hunt for signals of dark matter — a mysterious substance that doesn’t emit or absorb visible light. Some scientists suspect that dark matter could be formed from "exotic particles that produce a flash of gamma rays when they interact," NASA officials explained in a statement. "As the LAT builds up an increasingly detailed picture of the gamma-ray sky, it simultaneously reveals how dynamic the universe is at these energies," Peter Michelson, the instrument's principal investigator and a professor of physics at Stanford University in California said. During its five-year mission, Fermi successfully dodged space junk and helped astronomers investigate gamma-ray bursts: the most powerful explosions in the known universe. The probe's Gamma-ray Burst Monitor (GBM) instrument sees the entire sky except for the part blocked by Earth on the lookout for these powerful bursts that could happen at any moment. "More than 1,200 gamma-ray bursts, plus 500 flares from our sun and a few hundred flares from highly magnetized neutron stars in our galaxy have been seen by the GBM," principal investigator Bill Paciesas, a senior scientist at the Universities Space Research Association's Science and Technology Institute in Huntsville, Ala., said in a statement. 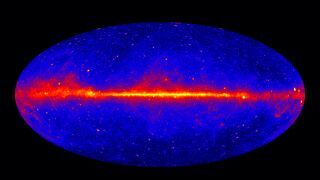 Fermi also made a surprising galactic discovery in 2010. The probe found giant bubbles stretching more than 25,000 light-years above and below the plane of the Milky Way, NASA officials said. The mysterious structures could be the result of outbursts from the supermassive black hole at the center of the galaxy. Editor's note: This story was corrected on Aug. 23 to note that while the Fermi space telescope has entered an extended mission phase, operations all the way through 2018 are not yet final. Scientists hope the mission will last another five years, but it will depend on periodic reviews.